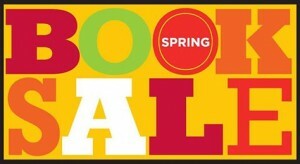 Gently used books, videos, and audiobooks for all interests at great prices. The market reopens on the Downtown Square Saturday, April 2, 2016 and will run from April through November. Time: 7 a.m. to 2 p.m. This is your chance to witness the hottest vocal bands from around the country competing for the title of VoiceJam Champion. Hosted by aca-amazing a cappella producer Deke Sharon, the competition portion of the VoiceJam festival is full of audience participation and fun for all ages. Come cheer on these vocal masters and cast your vote for aca-fan favorite! Jack hates poetry. Only girls write it and every time he tries to, his brain feels empty. But his teacher Ms. Stretchberry won’t stop giving her class poetry assignments – and Jack can’t avoid them. But then something amazing happens. The more he writes, the more he learns he does have something to say. Adapted from acclaimed author Sharon Creech’s book of free-verse poems, Love That Dog tells the story of how Jack finds his own voice with the help of a teacher, a writer, a pencil, some yellow paper and of course, a dog. 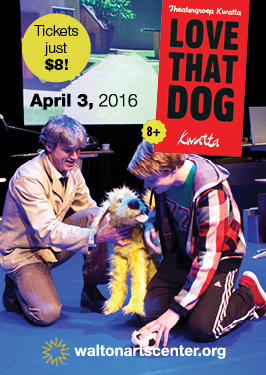 Best for ages 8+ and tickets are just $8! The Scott Family Amazeum will again host Priceless Nights in 2016. The pay-as-you-wish evenings allow families to visit and make a donation instead of paying admission. Guests will find the same quality of programs and learning opportunities as any other time the Amazeum is open. Hershey’s Lab will be open for families to conduct scientific experiments using Hershey’s brand confections. The 3M Tinkering Hub will have tinkering activities for guests age 7 years and older. Outdoor areas will be available as weather allows. Priceless Nights are available thanks to a grant from Tyson Foods. 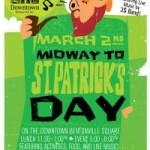 On the first Thursday of each month from April to October, First Thursday Fayetteville transforms the city’s historic Downtown Square in to a vibrant arts district, featuring the work of more than 40 visual artists, live music, street performers, food and drink, and children’s activities. 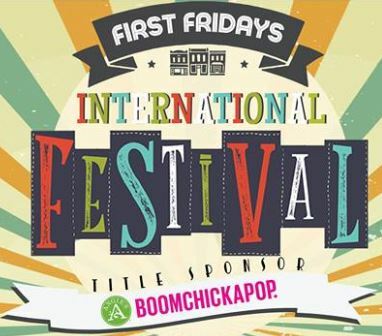 First Thursday Fayetteville is a (free, family-friendly) monthly event held on the Downtown Fayetteville Square, celebrating original works of art. On the first Thursday of each month, an outdoor art walk, live music, and a local craft beer garden take over the Square, while participating galleries and art-related venues offer free access to visual and performing art starting at 6:30 p.m. Starting in May, the Fayetteville Public Library’s Kids Stage act will be from 6 pm – 6:45 pm. Downtown Springdale will come to life every second Friday night of the month with outdoor screenings of iconic American movies. The public is invited to bring a lawn chair or blanket and lounge on closed streets or grassy lawns. Moonlight Movie Nights will start at 8 p.m. or dusk, whichever comes later, on the second Friday from March through October. The films will be displayed on the side of the Archer Learning Center at 500 E. Meadow Street, across from Luther George Park. A portion of Meadow and Water streets will be closed from 5:30 p.m. through 11 p.m. each film night. Here comes a classic in the American Theatre. Arsenic and Old Lace is a frenzied, hilarious, madcap black comedy. Spinster sisters Martha and Abby have many gentleman callers, and at their age! Funny, until we realize they all end up buried in the basement by a brother who thinks he is Teddy Roosevelt burying the victims of yellow fever! Their unsuspecting nephew deals the best he can with all this insanity — from elderberry wine, to murder, to family crazies and criminals, to play-writing policemen, plus love and marriage! The show that’s brought hilarity to millions worldwide is proving that laughter truly is the best medicine. 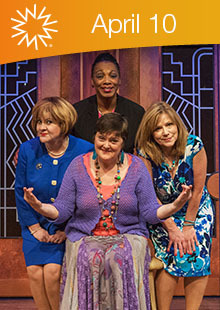 Menopause The Musical is a musical parody set to classic tunes from the ‘60s, ‘70s and ‘80s that will have you cheering and dancing in the aisles! With a cast of breast cancer survivors and co-survivors, this show is the first of its kind, partnering with Susan G. Komen and donating a portion of every ticket sale to end breast cancer forever. Note from the mamas: We’ll have a booth at the Jones Center Open House from 10 a.m. to noon, so stop by and see us! 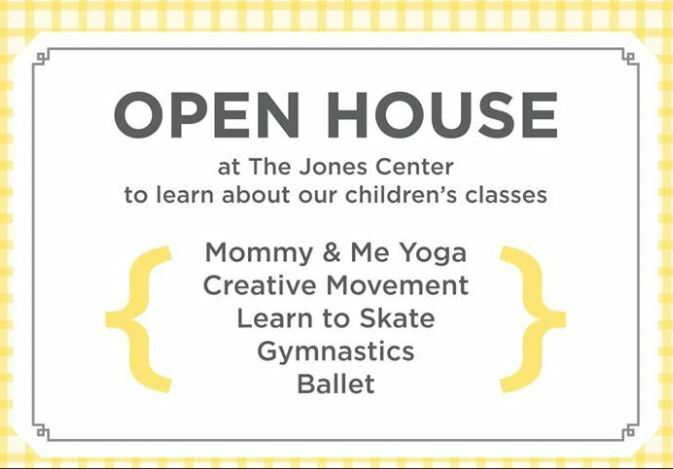 You’re invited to attend an open house at The Jones Center to learn more about children’s classes including: mommy & me yoga, creative movement, learn to skate, gymnastics, and ballet. Attend a free abbreviated class: Yoga at 10:20am, Creative Movement at 10:45am. 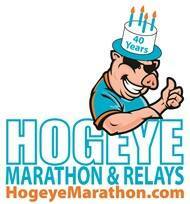 The Hogeye Marathon is a non-profit organization that gives back to Northwest Arkansas. It’s celebrating its 40th anniversary on April 10th and offers something for everyone with a marathon, half marathon, 5K, 4 person relay, corporate challenge, and volunteer opportunities. Everyone is encouraged to Glow from Head to Toe! Food/snacks on sale from local vendors. Family-friendly environment with inflatables and activities for all ages. Prizes: Top 3 overall, Top 5 each age category; Best Glow from Head to Toe participant. THE BRIDGES OF MADISON COUNTY, one of the most romantic stories ever written, is now an irresistible, two time Tony Award®-winning Broadway musical. With gorgeous, soulful music that the Daily News hails as “one of Broadway’s best scores in the last decade,” THE BRIDGES OF MADISON COUNTY is the unforgettable story of two people caught between decision and desire, as a chance encounter becomes a second chance at so much more. Held the weekend of the last Sunday in April each year, the Dogwood Festival brings an estimated 30,000 into the two major downtown parks in Siloam Springs. The award-winning festival has exhibitors from all over the United States setting up their booths. Handmade, assembled and resale items are all included in the more than 200 booths trying to draw shoppers in to buy something special. Dogwood Festival food vendors provide a variety of home-cooked foods including red beans and rice, gumbo, bread pudding, smoked chicken dinners, tacos, turkey legs, catfish, hamburgers, hot dogs, caramel apples, funnel cakes, kettle corn and cold drinks. The KidZone provides rides and activities for the younger festival-goers including a trampoline bungie jumpers, inflatable obstacle course, a rock-climbing wall, a mechanical bull, a train ride, bouncing activities and much more. Super Science of Northwest Arkansas will be having a science night with the Girl Scouts! Don’t miss out on this unique opportunity to experience an evening of mind blowing science and also learn more about becoming a Girl Scout. Cost to participants is free and fun patch will be provided, courtesy of the Fayetteville Service Unit. 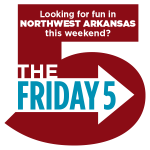 RazorFest is a free, family-friendly event held prior to the annual Red-White game at Donald W. Reynolds Razorback Stadium. RazorFest includes games, inflatables, concerts, performances, autographs, mascots, healthy tips, giveaways, and more. This conference will have Susan Goss and Anne Rana (two licensed family therapists) leading the main sessions and 12 breakouts to choose from (you pick two). Topics range from young children to adult children to parenting your parents to step-parenting to foster/adoption to teenagers to parents of special needs children and MORE! 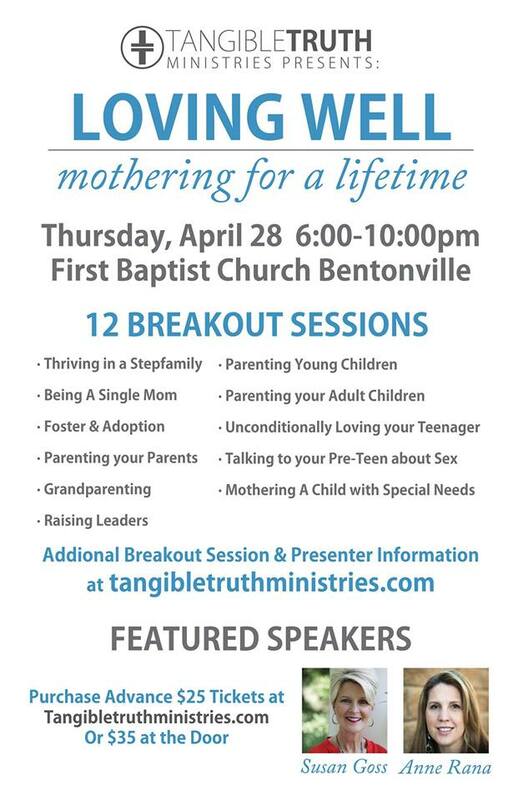 You can find all the info AND get tickets at tangibletruthministries.com. The annual Bradford Marine Buddy Bass Tournament is a fundraising and community development event with proceeds directed toward economic development projects of the Rogers-Lowell Chamber of Commerce. The tournament has grown each year and features a fun weigh-in attended by a large crowd. The event also features a free Buddy Bass Kids Fishing tournament, prizes, food and entertainment. The Mill Street Market offers farm products, crafts and baked goods on Saturdays from 8 am to 1 pm and Tuesdays from 5-8:00 pm, starting April 30th. All produce is locally grown in Washington, Benton, Madison and Carroll counties. In addition to food, the market will offer Arkansas Made needlework, soaps, salves and more. 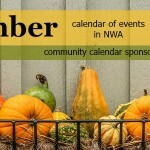 The Northwest Arkansas Calendar of Events is sponsored by The Jones Center for Families in Springdale. There’s ALWAYS something fun happening at The Jones Center, plus they have all kinds of classes for adults and kids — and great birthday party options at the indoor swimming pool, gymnastics or ice skating rink! 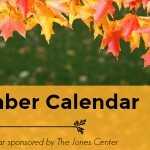 CLICK HERE to visit the Jones Center website to see more! Today is National Doctors Day! Local Snapshots: Spring snapshot contest starts today!